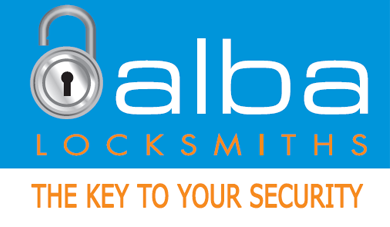 You’re four blogs into Alba‘s five-part series giving you some exciting and juicy exclusives about what locksmiths can do to help you…. Commercial premises are popular targets with burglars and there are many ways in which locksmiths can help you secure your business against any attempted burglary. Restricted & Master Key Systems are used by many entities to control access to different buildings, rooms, cupboards, and other areas. There’s more info & a handy illustration here. Anti-Jemmy Strips & Door Guards are metal strips attached to the opening side of a door to prevent it being forced open. They are also used on double-opening doors. Not just utilitarian, they can be designed to look very smart on your doors. Door Closers ensure that doors are closed after being opened. Mainly used to prevent the spread of smoke and fire, but give additional security as they will never stay open, thus preventing intruders gaining access. Window & Door Grilles are fitted to stop unwanted entry through vulnerable access points. High Security Locks are designed to resist manipulation and destructive attacks. Anti-Ram Raid Bollards are installed in front of exposed doors and floor-to-ceiling windows to prevent ram raiding attacks. Padlocks Your locksmith can provide you with the perfect padlock for your needs and also the correct type of hasp & staple, should it be required. Padlocks can be used with Restricted Key Systems and can be keyed alike. Safes are a valuable part of your security system. Data safes are very popular as they are designed to keep your data back-ups & essential paperwork safe even through a fire. A locksmith will specify the correct safes for your needs, they’ll also gain access to, maintain, and fix safes. Key cabinets should be used to keep all your keys safe. These can be accessed by key or by code depending on the product. Cabinet & Cupboard Locks can be supplied and installed for further security measures. As with anything mechanical, regular maintenance applies to all locks as well. A quick repair, done early, may prevent future problems and ensure that your premises and assets remain secure. Before you go into any of this, however, ask your locksmith for a free, no obligation security check. Then you know what you need, the relative urgency of each need and you can formulate an implementation plan. Become a Security Smartass, read more Part 5 !